We are going into the first full week of December. You know what that means... its crunch time. Crunch time for Christmas decorating, Christmas presents and Christmas photos! 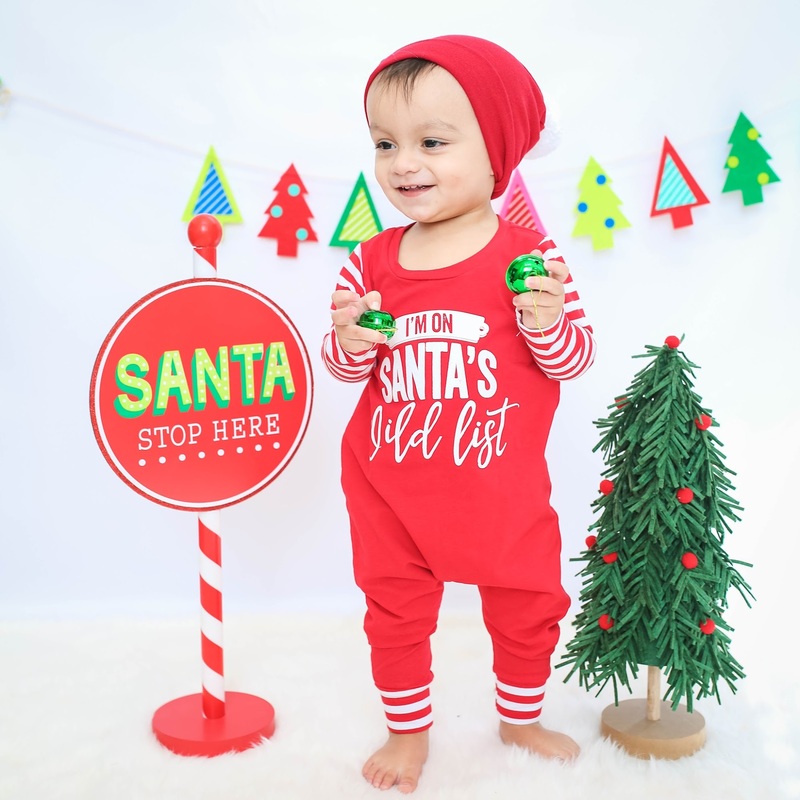 For many people this time of year is crazy expensive and not much wiggle room is left to pay hundreds of dollars for Christmas themed photo shoots. Today I'm going to tell you how you can create your own photo shoot for your kids from the comfort of your own home. Keep in mind, this is not meant to create the same type of professional photos that a professional photographer can provide, but for most people, these DIY photo shoots can suffice when you simply don't have the extra cash to spare to pay for professional services. 1. Camera: You do not need a big fancy DSLR camera to take photos! This is such a huge misconception. Don't get me wrong, they are great, and I use one myself. But I want to stress, you can easily get great photos by simply using your iPhone if you have great lighting and editing to work with! 2. Lighting: Lighting is so important! If you are shooting indoors, the trick is to find the best lighting in your home. I have a handful of great spots to choose from in my home for certain times of the day. I find that mornings/mid-day work best in my front room and master bathroom while mid-day to early evening (before the sun sets) work best in my family room or kitchen. 3. 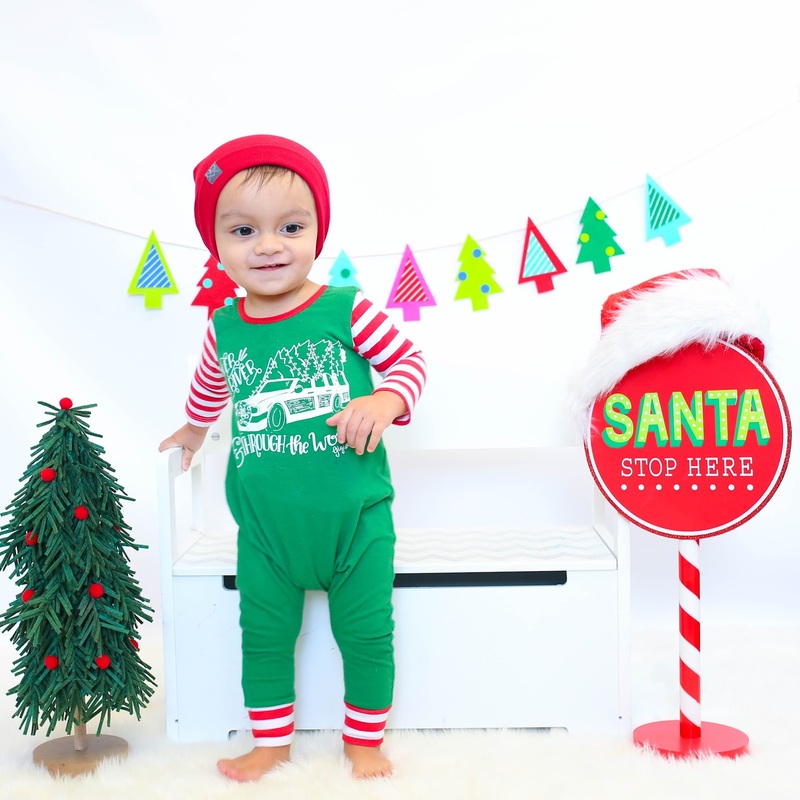 Props/Backdrop: Props are not necessary but can be a fun and cute addition to your photo. 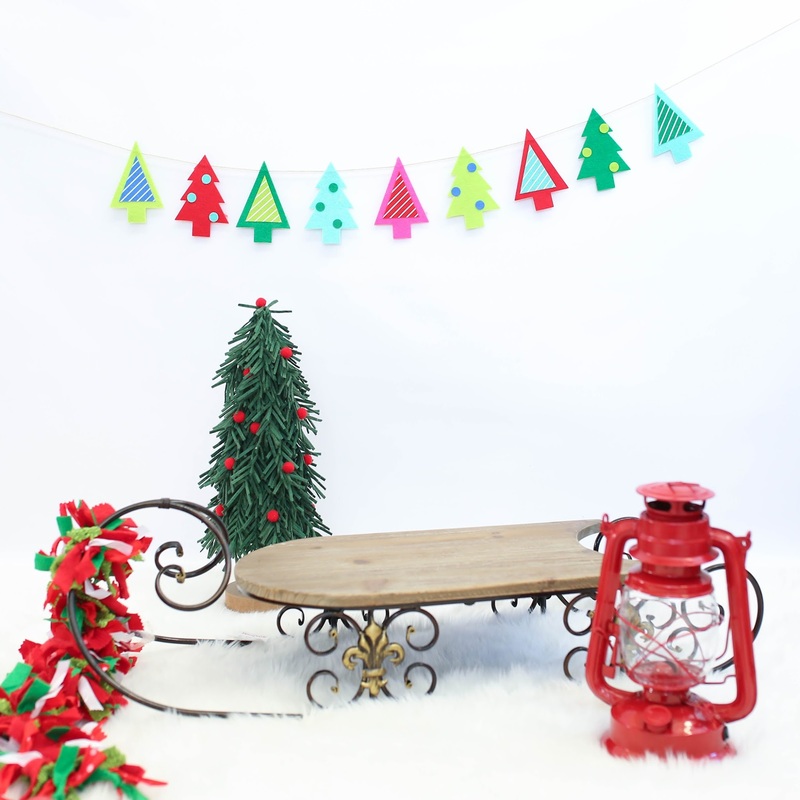 You probably don't even need to leave your house to buy any, you may have some stored away with your Christmas decor. Don't have anything handy and don't want to spend a small fortune? Wrap a shoe box with wrapping paper and throw a bow on that baby. Have your little one hold it or place it near their feet. This year I took advantage of the Target dollar spot, as well as a really good sale they had on Christmas decor. 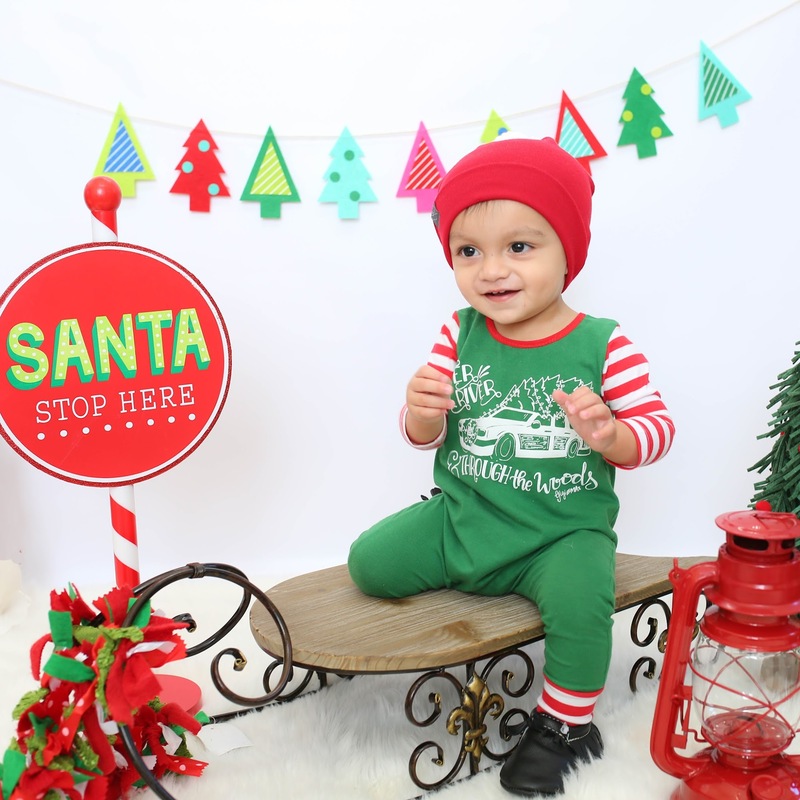 If you are looking for an inexpensive backdrop, try checking out vinyl backdrops on amazon. Don't want to invest in the vinyl backdrop or running low on time to order those Christmas cards? Try using a fun wrapping paper print tapped to the wall or skip the backdrop altogether. I've seen some very nicely done photos against white walls. If you have a fun colored wall, even better! My favorites recently have been dark grey and bright yellow walls. These are not your typical Christmas colors but they really do make the photo so much fun! 5. Editing: There is no doubt that Photoshop and Lightroom are favorites for professional photographers in aspect of editing software. However, these programs are not cheap. Looking for an alternative? I've got a list of the top 3 free apps that you'll want to take advantage of! And that's it! Remember to have fun with it and that sometimes the unposed photos where your kids aren't looking at the camera can be real winners. Those are actually my favorite types of photos. I love your photo sessions! I’ll need to check out some of those editors too! Thanks! The clothes. The props. The tips. Everything about this post is just great! Love the tips, I have used this tips before and they make for great shots! Lighting is definitely important! Our home doesn’t have many spaces with good lighting, which is one of the main reasons we did our son’s newborn photos at the photographer’s in-home studio instead of having her come to our home. Stealing all these secrets cause Nicole’s photos are always on point! lol! These are fantastic tips! Maybe I will try to take my own! Love VSCO! And of course, beanies. Loved this!! Perfect lighting is key! Also love the rompers, thank you for sharing!! Great tips, lighting is so important. Also remember, framing and focus when taking a picture too. Love these! I sometimes just use a white sheet for my backdrop! Yes to all these tips! Your photos turned out great! Love your pictures and these tips are so helpful!! Noxx rocks! Really good point about the camera!! The iPhone really does take some of the best photos!! Also… above “?” on my comment was supposed to be a smiley face… sorry! New to the blogging world! Lol! Be patient with your little one! If at first you don’t succeed, take a break and try again later!! :) Love these tips! Excited to take a pic of our sweet girl in front of our Christmas tree! Such a cute idea!!! Those beanies really are an adorable touch to his outfits! I have been wanting to try to take holiday photos at home-this came at the perfect time. Thank you for the great and helpful tips!! Thanks for the tips Im going to try them out! Thanks for the editing app tips! I will check those out. A Noxx beanie always makes our pics even cuter! A simple list of practical must-haves for a summertime hospital bag! Halloween is almost here...are you ready? Get inspired with these NOXX Halloween looks!